I love to read, and want to instill a love of reading into my children. They all seem to love books as much as I do, and I take great joy in finding them special books for each holiday, as well as things that are unique to them. For example, Margo loves owls and flamingos, so she has books about those animals. Something unique to our family is that we have identical twins. There are both joys of being a twin as well as special challenges. I love making book lists and thought DUH, I should definitely have a list of books about twins. 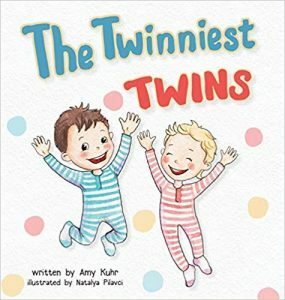 If you ever need gifts for twins, a book that celebrates the unique gift of being a twin is absolutely perfect. This book is a sweet little book about little bear’s family who’s expecting a new baby. It addresses her concerns about what will happen when the new baby comes and if her parents will still have time for her. There’s a surprise at the end…. you guessed it, mama bear is actually having twins! This is a fantastic book for a child who’s about to become a new big sibling to twins. 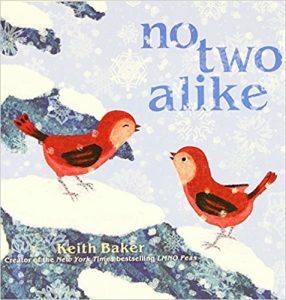 This book is perfect for twins who have distinctly different personalities. It’s about two small town ducks, Olivia, and Lily, who are constantly told how much alike they are. Even though the ducklings are identical twins, they have different interests and personalities. Twins can be different, and that’s OK! A great little board book that explains the special bond that twins have. It’s a perfect story for toddler twins that celebrates the joy of having a built-in best friend that you can do anything with! This book doesn’t specify if the twins are boys or girls, so it works for any set of twins. An adorable and sweet rhyming board book that’s super fun for younger children. The illustrations are very sweet and portray boy/girl twins. This book is so cute, it’s perfect for every bookshelf, even if you don’t have twins! A cute, rhyming story about bathtime fun with two babies. This is a great choice if you have little ones who don’t like baths and is geared towards babies and toddlers. 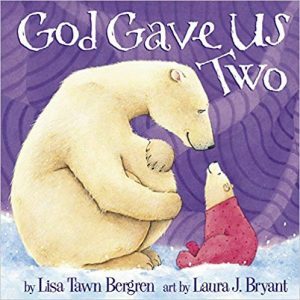 The author has two adorable picture books featuring twins. 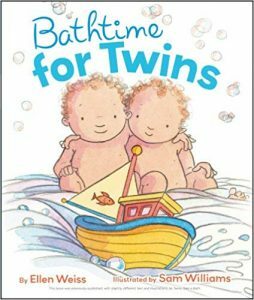 By the same author as “Bathtime For Twins,” this book is all about twins being friends and playing together. The illustrations are adorable and you and your twins will love reading about the fun the twins in the book have. 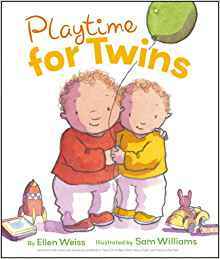 Sometimes my twins need a little reminder to play nicely and love each other, and this book is great for that! 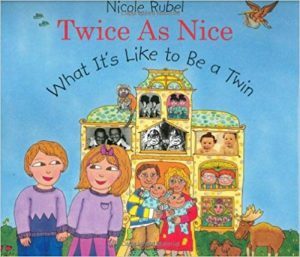 This is a wonderful book for older toddlers and preschoolers that celebrates the fact that although twins may look very much alike, they are indeed their own people. A great book to teach twins that they are unique individuals. The pictures are very minimalist, with the red birds being the only real pop of color. A cute little book about boy/girl twins who like to do different things despite being multiples. This book is very short and the storyline is very simple, making it a great choice for babies. This book is a play on the many comments that twins and twin parents get, along with witty answers. 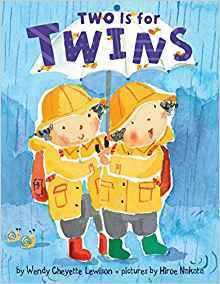 An example: “I’m seeing double!” “Maybe you should get your eyes checked!” It answers every question you could possibly get while out and about with twins and has fun stories and facts in it. It’s for ages 5-8 or so not for younger toddlers. First of all, I love this book so much because of the name. 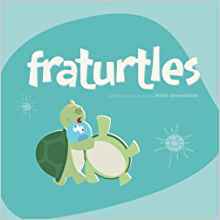 Fraturtles? So cute. The twin turtles in this book are confused because they are twins but they don’t look alike. 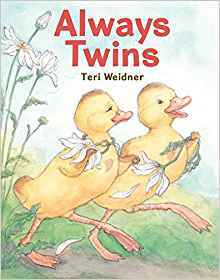 They’re told that it’s because they’re fraternal twins but they misunderstand and hear ‘fraturtle.’ This book does a great job of explaining that being a twin isn’t about looking alike, it’s the joy of having a best friend to share life with through the years. A very cute book about boy girl twins. 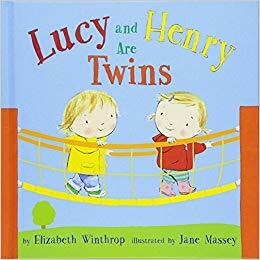 This book is wonderful because it celebrates the gift of twindom and also makes it clear that twins can be independent and have their own individual personalities. 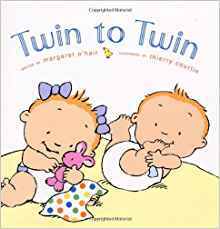 There is another book by the same author called “The Twinniest Twins and Me” that is absolutely perfect for siblings of twins. That’s my list! I’ll do an updated on someday on the best twin books for older children. I remember loving the Sweet Valley Twins series as a preteen, and I think it would be so fun if my twin girls enjoyed reading them when they’re older. Don’t forget to follow me over on Instagram to keep up with our shenanigans!